We had many interesting stories when we were remodeling our house. One of the best stories I remember is The Day I Shot the Rat. Yes, a rat. And yes, I shot it!!! Now you must understand, I am a lily-livered coward that screams and jumps at imaginary mice or rats. When we moved into our little one bedroom bungalow, mice were already there. However, since I had just had our fifth child, the oldest being 6, I was so plum tuckered out by the end of the day that I didn’t care if a capybara was crawling through the house. After we decided to evict these previous occupants, we wanted to be humane, and also, I feared one of the kids would get their fingers caught in a snap trap, so we got glue traps. Soon it became a quest of how many mice we could get on one glue trap. We were especially proud when we got six mice on one of the bigger glue traps. Anyway, we continued to have mice on and off until we got a couple of awesome cats and then our problem never reappeared. On very rare occasions, we would see rats. Usually toward the end of summer when the creek dried up down the street they began to appear. Once, when we first starting remodeling, the one bedroom was demolished and my husband had framed up the two bedrooms. After he put up the exterior plywood, the exterior wall at the existing bathroom was left intact. The waste stack was left there until the new bathroom was functioning. For a time, this wall length exterior pipe was inside the house. As I used the bathroom, I would hear strange scratching from the pipe. Since I was probably pregnant or nursing and suffering from extreme sleep deprivation, I ignored the sound. One time, however, after using the bathroom and hearing the noise, I became curious and went to look at the pipe. The pipe was now inside the new structure so I just turned the corner after leaving the bathroom. I peered through the studded walls and looked at the top of the pipe, and instantly an enormous rat stuck its face and chest out of the pipe. I let out a scream that I didn’t think I was capable of. (I secretly envied the Tippi Hedrens and Janet Lees that could produce blood curdling screams. Ironically, I gave birth to several of those kinds of screamers.) I yelled for my husband and he put a rock on top of the stack, but the image of that face and the way he looked at me still haunts me. But the day I shot the rat is by far the most memorable story. My husband, the baby and I were sleeping on a sofa bed in the living room and the five or so other kids were in the little room. One night I was beginning to doze off, I heard a noise. Thumpety-thump. Thumpety-thump. My eyes flew open and I froze. My ears strained to identify this mysterious sound. A mouse?? A big mouse??!! Urgh. Thumpety-thump. “Uh oh, more than one?” I thought. A childhood fear prevented me from looking because it could have been a giant monster or something. “Francisco,” I whispered to my sleeping husband, pushing him to wake up. “Francisco, there’s a big mouse in the kitchen. Francisco,” I shook him harder and he mumbled. “I heard a mouse, I think he’s under the fridge, sounds like he’s chewing on a tortilla or something.” Still asleep, I shook him real hard and raised my voice, “Francisco, there is a mouse under the refrigerator, can you go check it out?” Finally he turned over and paused, listened to the sound under the fridge; opened one eye, then bolted straight up. “That’s no mouse!” He declared quite loudly. He got up and grabbed his BB gun from the top of the bookshelf. “I’m gonna shoot that rat!” he said determinedly. I watched him aim; I couldn’t look toward the fridge because I didn’t want to see how big the rat was. It was quiet for a long time, the chewing stopped. Bing! A shot sounded from the BB gun. The noise was coming from the sliding glass door. A beautiful mosaic of cracking glass was slowly climbing to the top of the door. It actually looked pretty with the street light shining in the background. “You hit the sliding glass door?! !” I said, holding my smirk inside my mouth. “I’m going to sleep.” And he turned over. “Was it a big rat?” I winced at the question. “Oh, no…” I went to sleep to the sound of crackling glass. The morning was a buzz as soon as the kids woke up. “What happened to the sliding glass door?” one asked, “Who broke it?” another asked. “Why did he shoot the door?” one asked. “He didn’t mean to shoot the door; he meant to shoot the rat.” I said while pouring my coffee. “A Rat!! !” they all screamed, “there was a rat in the house.” The chorus of voices ran down the hall to their little room and tell their big sister, “Dad tried to shoot a rat last night, but he missed and hit the sliding glass door. It is all broke now.” All kinds of hoots and hollers came from their little bedroom. Dad walked in the door and the kids crowded him, “How big was the rat, Dad? Why’d ya shoot the door, Dad? You broke the door; I thought you knew how to shoot.” “Weren’t you in the Army, Dad?” The questions were fast and furious, and the look of irritation grew on my husband’s face. He grumbled as he passed them and gently broke off the pieces from the door and cleaned up the mess. “You guys, get away from him while he cleans up or you’ll get cut.” I ordered. It was a slow morning; I was too tired to cook breakfast so I got some donuts. I told the shoot-out story to the kids while we ate them, and Francisco left for work. The day went by typically, and the kids were in the backyard when I heard a commotion begin. I waited to see if it would die down or get worse. Emilio ran in the house and immediately went to the bookshelf and grabbed the BB gun. “What, what!! !” I squawked. “Wait, no one is gonna shoot that rat…..but me.” I took the rifle from Emilio and followed out to the backyard. The kids were excited, “Everyone get out of the way,” I ordered. Because of the construction work we were doing, the underneath of the house was fully exposed from the back side. From the backyard, you could see Gracie, our little black lab, slouching next to an unconscious rat under the floor. “Did she kill it?” Emilio asked. “Are you gonna shoot it? “Yep, stay back and watch those babies.” I lifted the rifle and carefully aimed at the rat, and yes it was a big rat. In the line of vision, stood a very frightened Gracie. “Get outta there Gracie.” I ordered and she eagerly fled. I re-aimed, it was very quiet and I steadied my arm. “You hit it, you hit it! !” the kids all yelled. “Do you think you killed it?” Elizabeth asked holding the hands of two toddlers. “I’m not sure, but I will try again. Hold on to those babies, everybody stand back, I’m gonna shoot again.” I aimed again. I wasn’t so sure, and really didn’t what to do now. We pulled it out from under the house with a rake and tried to see if it was breathing. The roar of my husband’s van could be heard as he came around the corner. The kids dashed to meet him in the front of the house. “Mom shot the rat!! Mom killed the rat! !” The kids were all talking at once. 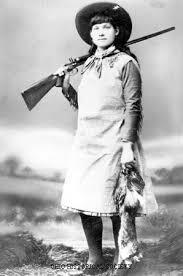 Here was my chance to look like Annie Oakley, so I slung the rifle up on my shoulder and coolly sashayed out to meet my husband. “What’s going on? Did you find the rat?” He asked, looking at me kind of funny. Dad finished the job and we stuck the rat in the donut box and threw it in the garbage.